Is there anything on the planet that brings people together more than food? We gather around the table as families and friends to celebrate everything from birthdays and anniversaries to major holidays like Thanksgiving and Christmas. Even enemies sit down and share a meal together as a sign of peace between them. Eating together somehow bonds people to one another. Behind the sharing of food is the actual preparation of our meals. Often, as the holiday seasons roll around, particularly Thanksgiving and Christmas, there is an enormous amount of work to be done in the family kitchen. Mothers (and sometimes fathers) find themselves spending more and more time preparing, and less time sharing time with their families. The holidays are primarily about family, spending time together, enjoying one another, and making memories that last a lifetime. But, in the middle of our constant activity, one of the greatest memory-making opportunities is missed in many homes — kitchen memories! Many parents immediately cringe with fear when we hear the phrase “kids helping out in the kitchen.” Images of knives, boiling water, hot pans, children underfoot, and injuries fill our heads. It is hard for us to do, but we can put those fears aside, and instead think of the positive (and how to deal with those fears). We want our children to be comfortable in the kitchen. With any luck, they may also learn to cook (and not only macaroni and cheese)! We also do not want to reach the end of the holidays and have the feeling that we did not spend as much time with our kids as we would have liked. As a family, we need quality time with them, to have fun, create lasting memories, prepare and eat great food, and teach them something about working in the kitchen. These are lessons for later in life! 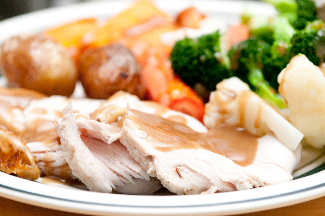 True, it takes a tiny bit of planning to get the kids involved in food preparation, but holiday meals take a good bit of planning anyway. To prep for a kitchen day with the kids, choose a few dishes, or a few specific cooking activities that you think your kids will enjoy (and be able to accomplish). Since you already have a plan for preparing the meal, just spending a few extra minutes thinking it through can help us see what opportunities are there for the children to be involved. The very youngest can help out with opening packages. They also love to sit in a tall chair or stand on a small stool and watch you work in the kitchen, especially if you talk with them about what you are doing. As kids get a little older they can also help out by watching timers, stirring, mixing, and even throwing things into the trash can. It’s amazing what will keep them entertained and help them feel involved. 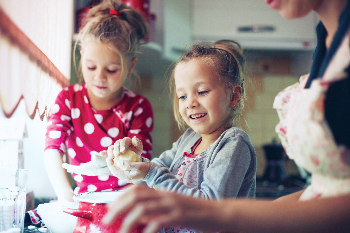 Older children can do virtually anything in the kitchen (with a little supervision), from cutting to assembling to putting things into the oven. And about those fears of having kids in the kitchen mentioned earlier? Again, a little planning helps take care of those concerns. For instance, if you worry about a little one getting burned, just be sure to set them up in a part of the kitchen where they will not be near the stove or oven. If it is knives that concern you, then just be careful of where you lay them down, and you can be double careful by choosing a certain place in the kitchen to cut that is “out of bounds” for your smaller children. Some thinking ahead and extra attention will keep your kids out of harms way. 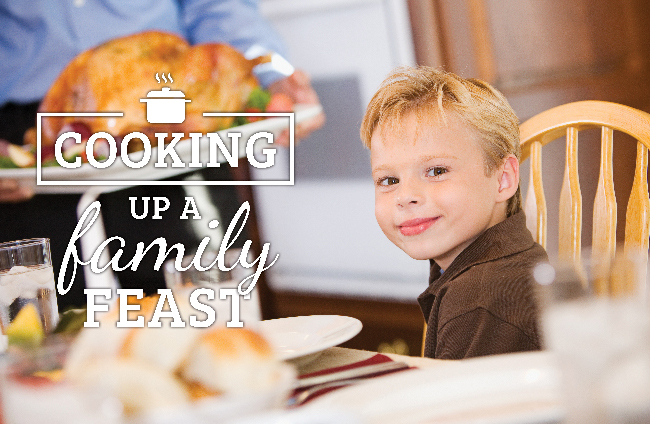 That way, you can focus on the kitchen fun with your kids and build memories and traditions that may be passed on. 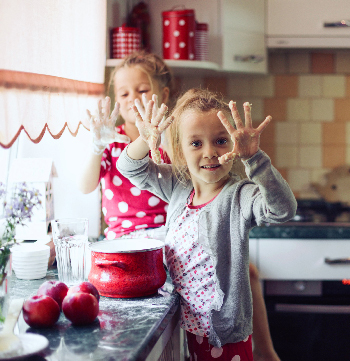 Cooking with our kids is not only possible, it can be wonderful fun. A great place to start is making cookies! It is relatively easy and provides quick gratification. Nearly everyone likes them and there are also plenty to share or even give as gifts to friends and neighbors. Here is a recipe to get you started. electric mixer, spoon, baking sheet (greased, lined, or non-stick), great holiday music, and a camera! This is such an easy recipe to do with kids, since there’s nothing sharp to work with — just measuring and mixing and cooking! Help your child set the oven to preheat to 350 (bake). Now put the mixer on slow, and have your child carefully add salt, vanilla, and eggs (kids love to crack open eggs…so have a few extras on hand!). Allow this to mix until well combined. Finally, add the flour and mix no longer than it takes to combine. Now, a part the kids love, stir in the chocolate chips by hand (not with the mixer). If a few morsels disappear, well, that is always okay…and a great photo opportunity! 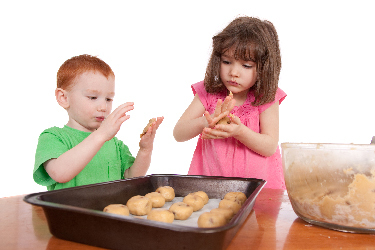 Kids enjoy helping put the prepared cookies onto the baking sheet before the parents slide them into the hot oven. Cook for 8-10 minutes and you have a wonderful treat for sharing with the kids, and with your holiday guests. Even if things turn out differently than planned on your first foray into the kitchen with your little ones, enjoy this time. Cooking together is all about the memories, not necessarily the perfect cookbook meal. Being part of something as important as preparing the big holiday meal (or even something simple like cookies) is an exciting opportunity for you and for them. Smile, Laugh, Talk — This is the Whole Point! When our children (especially older ones) are comfortable and enjoying themselves, then they seem to be more willing to open up and talk about things that they might otherwise keep to themselves. And we, as parents, have an opportunity to share as well, talking about our own childhood memories as we make new ones with the kids. We not only guide and teach our children, we also relate to them as human beings on every level, and that includes building meaningful and lasting relationships with those so dear to us. What better reason could there be for cooking in the kitchen than building those memories and relationships with ones we love so dearly — our children.